Four flights of stairs below the stage in the Frances Comstock Memorial Theatre are boxes filled with vampire teeth, prosthetic monster masks, beaded fabrics, and a powder that mimics blood when mixed with water. 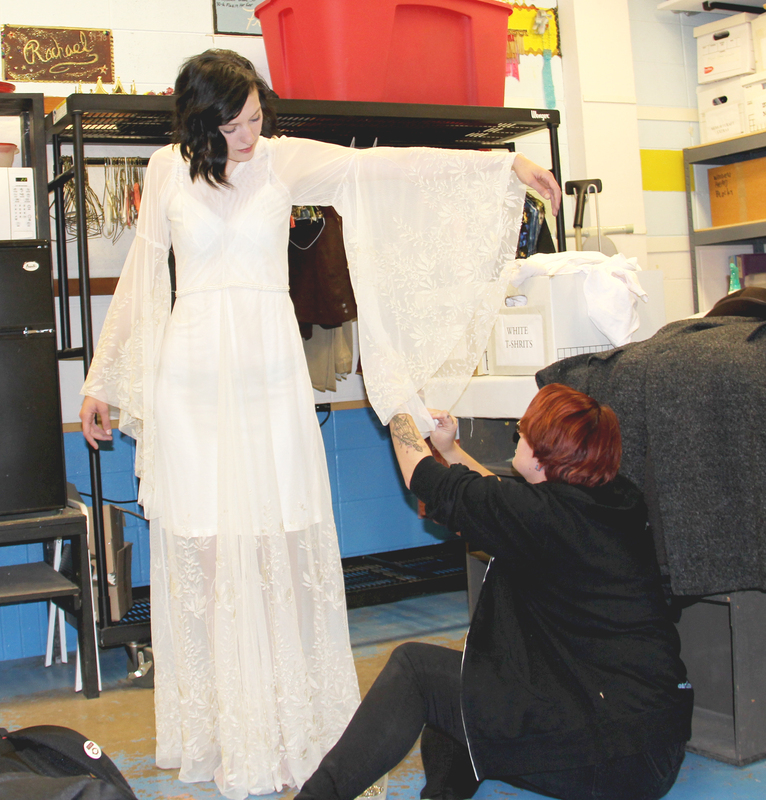 The Concordia College theatre department is preparing for William McNulty’s adaptation of Bram Stoker’s “Dracula,” opening Oct. 15. According to a press release from the theatre department, “Dracula” is a Victorian horror novel that has been adapted for the stage. It follows the story of a vampire hunter, an asylum doctor and a young couple who are investigating the mysterious death of a young woman. 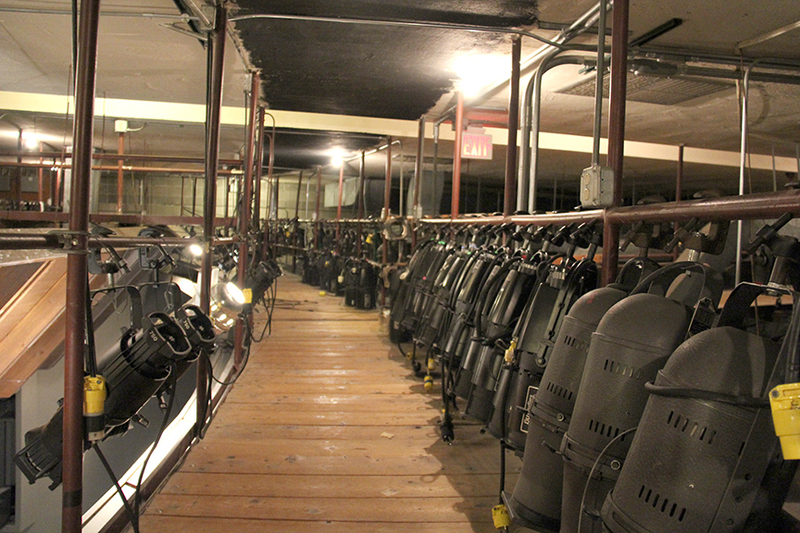 The catwalk above the audience houses the lights for the production. The show requires a fast pace and a variety of special effects, according to director David Wintersteen, who said it has been an exciting challenge for the cast and crew. Alicia Auch, who plays the role of Mina Grant, said that the play’s special effects play a major part in the production. The special effects are extensive, ranging from blood, fog, fangs and stage violence to characters that appear and disappear onstage, Wintersteen said. Actor Ben Habegger, who plays Robert Renfield, said the show will include pyrotechnics, rising platforms and subwoofers beneath the stage that will shake the audience during moments when the sound is extremely loud. Campus Lighting Director Bryan Duncan said that Dracula requires a large sound design that exceeds the designs of recent past productions on campus. Alicia Auch getting fitted for her role in “Dracula” by Costume Designer, Katie Curry. Photo by Reilly Myklebust. Costume Designer Katie Curry is also working to ensure that the audience is spooked by the performance. Curry designed costumes for Victorian-era asylum patients and doctors alike, which required some extra research on her part. She sifted through books, museum websites and paintings in an effort to portray the time period correctly. Curry has also been working to create the fake blood effect. In the dressing room downstairs, she has buckets of the powder and water mixture, which she is anxious to see onstage. In order for all the special effects to be timed correctly, there are more backstage hands than there are actors. The cast and crew will have their first full dress rehearsal with sound, lighting, costumes, props and other special effects on Oct. 10. “All of it is working together to create this really interesting and also provocative world where these characters exist,” Auch said. The time period between the first dress rehearsal and opening night is referred to as tech week. Aside from the special effects, Habegger said the show can also be physically demanding. Habegger injured his hand in rehearsal when he dove under the desk, which has added to the difficulty of portraying his character. When he is not on stage, he wears a splint, though he does not seem discouraged, and says the cast and crew have been mindful of his injury. Auch said that “Dracula” is the most physically demanding show she has ever done. Rehearsals have included a lot of running, combat and screaming. Wintersteen said that horror isn’t usually his “cup of tea,” but that he has learned to have fun with it. “There is the fun of your own body reacting to things, both knowing that something is going to happen and being surprised by what happens, and just going for that ride, and just immersing yourself in the experience,” Wintersteen said. Performances will be held at 8 p.m. Oct. 15 through 17 and at 2 p.m. Oct. 18 at the Frances Frazier Comstock Theatre. Tickets are free to Concordia students, faculty and staff and cost $10 for adults and $5 for other students and senior citizens.